For the automatic removal of the packing from packaged foodstuffs, Emmebi Systems proposes a machine that works even with vacuum-packed products. This model has been developed to meet a specific requirement: to open semi-finished products of the milk and dairy sector and to remove the package without manual intervention. Considering its potential, this system has been adjusted to handle all kinds of packed food products. The machine can automatically adjust itself to the size of the product to be handled. The packaged product (e.g. 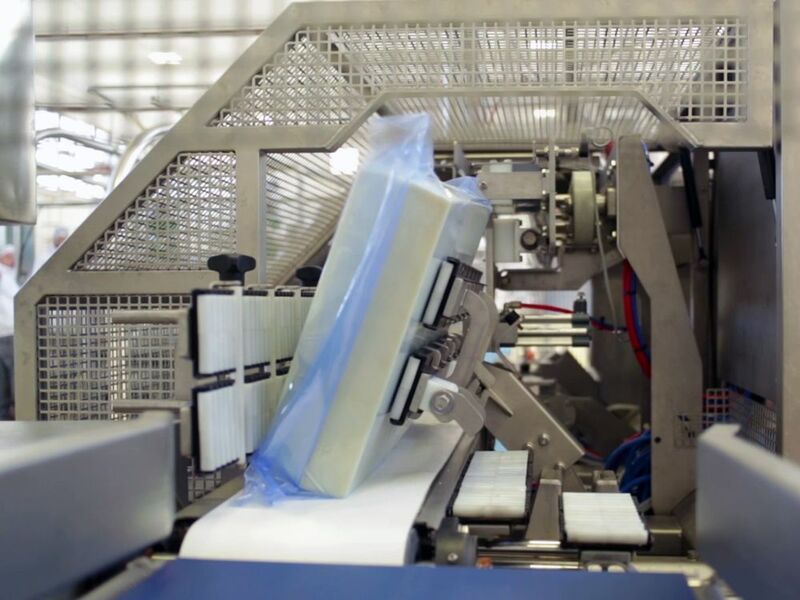 an Euroblock of curd) properly positioned on a conveyor belt, is cut on three sides, while its film or wrapping material is removed. The wrapping is discharged in a dedicated collection area without leaving any plastic residue, thus leaving the product in its position, undamaged and perfectly clean. The “MB de-packaging machine” eliminates continuous product handling efforts, increasing efficiency and productivity, allowing a constant and safe flow, with no manual use of blades or knives. The machine is washable (IP67), and the absence of any direct contact rules out contamination.